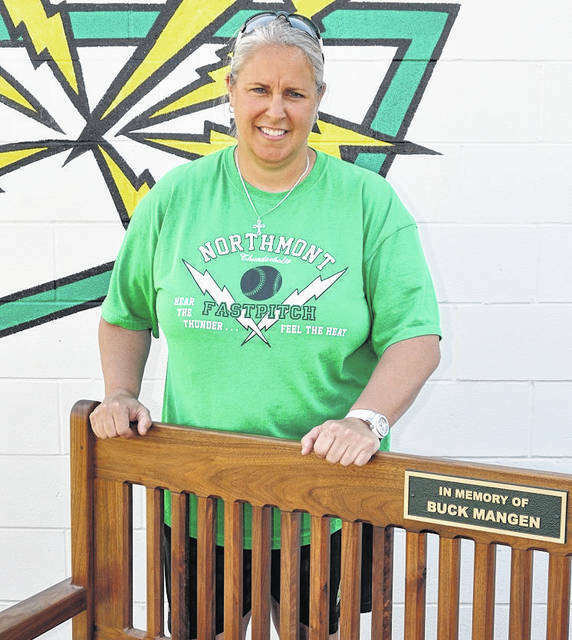 Northmont softball coach Kris Mangen. GULF SHORES, ALA — During its annual spring break trip the Northmont girls softball team won two out of five games in Gulf Shores, Alabama. Four games of the trip had a 75 minute time limit and ended at that point no matter how many innings had been played. The Lady Bolts finished the trip with a 19-0 loss in 5 innings to the Fairhope Pirates, a game that was not subjected to a time limit. Fairhope jumped out to a 5-0 first inning lead and never looked back. The Pirates had a nine run third inning to put the game out of reach. Senior Bailey Keith led Fairhope by going 3 for 3 at the plate with a triple and a home run with 5 RBI and scored two runs. Madison Koger, also a senior, went 3 for 4 with a double, one RBI and two runs. Other seniors getting multiple hits included Sydney Hamrick going 2 for 2 with a pair of doubles, three RBI and two runs and Emma Kropp 2 for 2 with a double, two RBI, two runs and a walk. Sophomore Bella Wiggins went 2 for 3 with a double and four runs. Eighth grader Bella Cabral went 2 for 4 with a double, two RBI and two runs. Freshman Alea Johnson went 2 for 2 with three RBI and two runs. Northmont got three hits, one each by Kaylee Wood, Carmynn Bonner and D.J. Shepherd who belted a double. Bonner pitched 1 and 1/3 inning giving up two hits and one unearned run. Hannah Seagraves pitched the final 2 and 2/3 innings surrendering 18 hits, 18 earned runs, with three walks and one strikeout. Mangen noted that Fairhope was a wonderful host with a cookout after the game. Northmont opened its trip against Dale County, Ala. losing 8-6 in four innings. Seagraves pitched two innings to take the loss and Bonner pitched the final two innings. The pair gave up a total of eight hits with four strikeouts, three walks and three hit batters. The Lady Bolts also committed three errors. On offense Northmont generated five hits. Northmont scored four runs in the fourth inning. The big inning was thanks to singles by Sierra Caskey and Kyra Rottgen, a groundout by Caroline Stanaway, and an error on a ball put in play by Megan Rasor. Next came an 8-3 loss in three innings to Houston Academy, Ala. Bonner started on the mound and took the loss pitching two innings. Seagraves pitched the final inning. Northmont gave up nine hits with one home run by Jasoni Fowler. Northmont’s runs came off six walks and had no hits. Northmont won its next game against Minor (Adamsville, Ala.) 11-3 in four innings. Seagraves pitched all four innings and scattered three hits, including a double and one home run and had six strikeouts. Northmont generated four hits and drew 10 walks in the victory. The Lady Bolts went on to post a 14-4 victory over West Point, Ala., in four innings. “That was a breakout game for us,” Mangen said. Bonner pitched all four innings, gave up three hits with one strikeout and four walks. Northmont generated 13 hits including seven extra-base hits with five doubles a triple and a home run. Northmont plays at Versailles on Tuesday and hosts Troy on Thursday and Beavercreek on Friday. All three games start at 5 p.m.